The Low-Down: How Come People Are Attacking Waymo Self-Driving Cars? How Come People Are Attacking Waymo Self-Driving Cars? See: the Luddites, the Google Glass haters, et al. 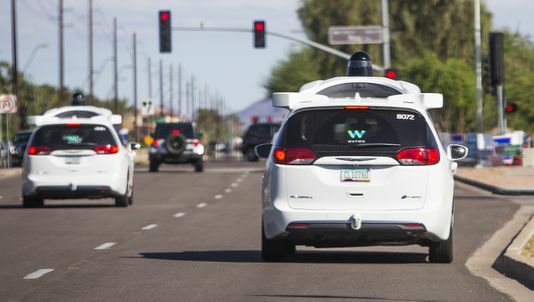 A Waymo self-driving van cruised through a Chandler neighborhood Aug. 1 when test driver Michael Palos saw something startling as he sat behind the wheel — a bearded man in shorts aiming a handgun at him as he passed the man's driveway. “(The suspect) stated that he was the person holding up the gun as the Waymo vehicle passed by and that his intentions were to scare the driver,” said a report from Detective Cameron Jacobs, after police arrested 69-year-old Roy Leonard Haselton on Aug. 8. Haselton's wife told officers he was diagnosed with dementia, according to a police report. Palos declined to discuss the incident. The Haseltons could not be reached for comment, and Roy Haselton's trial is scheduled for February. Waymo test drivers usually call their own company dispatcher when they are threatened or harassed, using the in-car, push-button communications system, which allows them to talk without holding a phone. They often do this instead of calling police directly, according to the reports. Company officials said that the drivers are trained to handle threats. “Safety is at the core of everything we do, which means that keeping our drivers, our riders and the public safe is our top priority," the company said in a statement. Test drivers can call police directly if they feel the threat warrants it, according to Waymo. Police have asked Waymo to have drivers to contact police immediately when drivers are threatened, allowing faster response times, but the company appears to minimize police interaction. After an incident in September 2017 where a man threw rocks at two Waymos, the company did not contact police for four days. The incidents outlined in police reports show that despite the excitement by some about Arizona's role in developing the cutting-edge technology, not all Chandler residents welcome the self-driving car tests in their city. That was clear Aug. 19, when police were called to Cheri Lynn Drive because a 37-year-old man who police described as “heavily intoxicated” was standing in front of a Waymo and not allowing the van to proceed. “He stated he was sick and tired of the Waymo vehicles driving in his neighborhood, and apparently thought the best idea to resolve this was to stand in front of one of these vehicles,” Officer Richard Rimbach wrote in a report. Waymo's test driver told police the man did not say anything to her as he blocked the van’s route. She told the officer that she would notify Waymo to stop routing vehicles to that area. Phil Simon, an information systems lecturer at Arizona State University and author of several books on technology, said angst from Chandler residents is probably less about how the Waymo vans drive and more about people frustrated with what Waymo represents. “This stuff is happening fast and a lot of people are concerned that technology is going to run them out of a job,” Simon said. He said the book “Throwing Rocks at the Google Bus: How Growth Became the Enemy of Prosperity” by Douglas Rushkoff attempts to explain the public backlash against successful technology companies with highly paid executives. The book’s title is taken from protests in San Francisco over the private shuttle buses that Google and other tech companies provide for workers, which some city residents view as a symbol of gentrification and a public nuisance. Simon said it is hard for middle-class people to celebrate technological breakthroughs like self-driving cars if they have seen their own wages stagnate or even decline in recent years. There may be many undocumented instances where people threatened Waymo drivers. Police reports indicate the company doesn't always report threats or harassment after an initial encounter, but might do so later if one person continues to cause problems. That was the case Nov. 7, 2017, when a Waymo driver had to take manual control of his van to avoid a dark Jeep that appeared to intentionally pull into his laneand drive at him head on. Someone driving the same Jeep had pulled a similar move on another Waymo driver the day before, and on four others in prior months. A Waymo representative said this had been an ongoing issue with the same Jeep and other Waymo drivers, Officer Samuel Garday wrote in a report. Waymo told police the same Jeep on April 6, 2017, passed a Waymo and then braked aggressively in front of it, and about two months later drove head on toward a van near Del Rio Street and McKemy Avenue, forcing the Waymo vehicle to stop. In early August of that year the Jeep swerved toward two other Waymos, and did it twice more in November. The Waymo driver in one of those incidents had been in a van hit by a rock in June 2017, according to police reports. Police used video footage from Waymo to identify the license plate of the Jeep. Garday visited a home and spoke with the mother of the man who was the registered owner of the Jeep. In some instances, annoyed residents have called the police on the self-driving cars. That was the case on Oct. 5, when Juli Ferguson called to report suspicious activity by a Waymo. She said the car's test driver appeared to be watching children playing for approximately 90 minutes. An officer contacted the driver, who reported conducting diagnostics on the vehicle and left. "Everybody hates Waymo drivers," Ferguson told The Arizona Republic. "They are dangerous." She said she called the police about the driver not because she dislikes the vans, but because the test driver had been parked in the area for so long. Some police reports indicate that Waymo simply directs its vans to avoid neighborhoods where people have complained about them. Ferguson said that before the incident with police, she saw the vans in her neighborhood all the time. Since then, she hasn't seen one. Another event took place April 18, when Leah Bragdon called Chandler police to report what she thought was a drug deal between a Waymo passenger and a neighbor on her block. concerned with the drug activity and thought it was interesting that the driver would allow that all to happen." Police responded but did not make any arrests. Chandler residents called police on suspicious Waymos two other times in 2018. In recent months, Waymo drivers have reported cases of their vans being followed. On Oct. 21 at about 10:35 a.m. an officer was dispatched to interview a Waymo driver who reported being followed by a black Hyundai sport-utility vehicle for close to an hour, starting near Baseline and Alma School roads. The Waymo driver pulled into the Chandler Police Desert Breeze Substation and the Hyundai drove away, but then passed by again, according to the report. The Waymo driver reported the Hyundai had California plates and two men inside. Wagstaff waited with the driver at the precinct for about 15 minutes but the Hyundai never returned. The Desert Breeze Substation is also where a Waymo vehicle parked after calling police while being followed by an Arizona Republic reporter and photographer for a separate story. The Republic followed vans for several days to learn more about how they operate on Valley roads and freeways. On Oct. 10 a Waymo driver reported being followed for five to six miles by a red Kia Soul. The Chandler police report indicates the same vehicle was reported earlier that day in Tempe for following a Waymo vehicle in that city. Prior to that, on June 26, a Waymo driver reported a man in a white PT Cruiser followed him and pulled alongside him, making threatening gestures and faces. Video of the incident was recorded by another Waymo driving in front of the two cars, according to the police report. The man in the PT Cruiser then pulled alongside and made gestures to the second Waymo. Waymo declined to release the video of the incident, the report said, and the officer could not locate the PT Cruiser driver, as the car was registered to a woman who moved out of state. Police reports show a variety of other times when people attacked the vans but suspects were not identified. That includes on Oct. 24 when a Waymo stopped at Los Felize Drive and West Toledo Street around 12:30 p.m. and had one of its tires slashed by a man who came from a nearby park. On at least four other occasions people threw rocks at Waymos. Other events described in police reports include a bike swerving dangerously at a van and a man threatening to shoot a driver, but not brandishing a weapon.